Fabric shopping bags and small produce bags: these take up very little space and are essential when going shopping as many shops and supermarkets don’t have paper bags, even for fruit and veg. Small fabric produce bags are great for buying things like apples, tangerines, tomatoes, potatoes, bread rolls and so forth and they also have many other good uses whilst on holiday. Refillable water bottles: don’t be shy to ask for a refill – access to drinking water is a basic human right. You can download the handy refill app to your phone so that you can easily check where you can refill at participating cafés, pubs, restaurants, shops and venues. Many airports and train stations now have water drinking fountains. I love my stainless steel water bottle which is double-walled like a thermos, so it keeps cold drinks cold and hot drinks hot. It doesn’t have to be a metal bottle, but I find them very durable and I enjoy drinking from a non-plastic bottle. Lunch boxes: whether metal or tupperware, lunch boxes come in handy for packed lunches on your journey and for shopping for loose produce at your holiday destination. I often bring an empty glass jar with me as well so that I can buy olives and such items at local markets. Bamboo cutlery and straws: we each have a small and reusable set of bamboo cutlery which is great for take-away food from cafés and street food on the go. Instead of buying bamboo you could just take normal cutlery or camping cutlery. I might also take some metal drinking straws. This way you can refuse plastic cutlery and plastic straws and even save on compostable cutlery which nowadays is offered in many places. Compostable packaging is still a single use plastic which is made from plant crops and requires industrial composting to break down. Flannel, tea towel or handkerchiefs: avoid shop-bought moist wipes and take a flannel, tea towel or cotton handkerchiefs on your journey instead. Moist wipes are made with plastic and are a real scourge on the environment. They are on the list of things that will soon be banned in the UK and the EU. There are brands of paper kitchen towel and tissues that are not wrapped in plastic (Greencane), but why not take a flannel or handkerchiefs that can be washed and reused? Beeswax wraps: if you haven’t come across this brilliant alternative to cling film and foil then you are in for a treat. Beeswax wraps are reusable and natural. They come in handy for wrapping sandwiches, cheese, snacks and anything that needs to be kept fresh, like half a left-over avocado, cut fruit and carrot sticks. They make a great napkin for eating on your lap and for wrapping up banana peels and other bits & bobs until you can get to a bin. Toiletries and sun cream: some other items I will take with me include homemade toothpaste in a small jar, homemade deodorant, soap and a shampoo soap bar. Soap bars are also useful for business travel as most hotels package their individually portioned toiletries in plastic, creating an enormous amount of single-use plastic waste every day. Even if you abhor the smell of a Lush shop, I recommend that you buy their shampoo soaps and matching metal tin – superb for travelling with. Finally, I take a fantastic sun cream made in the UK which contains just four organic ingredients and comes in a metal container. Because it is so hard to buy ready-made lunches and drinks without plastic packaging whilst travelling, we are in the habit of taking our own packed lunch and drinks. It’s not as much work as you’d think if you keep it simple – sandwiches or filled baguettes, cold sausages, coleslaw, hummus, cheese, carrots, cucumber or radishes, fruit, as well as flapjacks, nuts and chocolate for something sweet to nibble on. Bring lots of water, which is also useful for washing sticky hands, and maybe a flask of hot tea. You could even buy a thermos made especially for taking soup if you fancy something homemade and hot. When travelling by plane, remember to empty your water bottle before you go through security. You can refill it at a café or drinking fountain once you’re in the departure lounge. You are allowed to take your own food on to a plane. Don’t rely on expensive airport cafés or train and airplane food trolleys for your sandwiches and drinks – it’s a plastic nightmare. Ironically, if you are on a long motorway journey, fast food chains such as Burger King can be useful for an emergency paper-wrapped meal that doesn’t break the bank (avoid the plastic sauces, plastic cutlery and plastic toys for kids though). If you are able, stop for a civilised restaurant meal to break your journey or find a chippy that uses paper for wrapping fish & chips. Markets are a great way to shop plastic-free on holiday, especially on the continent. Before you set off, find out about local markets near your holiday destination and make sure you know what day it is on. Shop at local grocery shops such as butchers, bakers and greengrocers instead of supermarkets. Here you can make good use of your lunch boxes when shopping for meat, cheese, olives and freshly made food such as quiche and pasties. If you are bold enough, you could take a big lidded pot from your holiday kitchen to the market or to the butcher’s to buy a whole chicken, for example. As always, choose unpackaged items over packaged ones, then cardboard and paper, then plastic if there is no alternative and you really can’t do without the item. Instead of buying everything from sliced bread to ice cream in the supermarket, make a special trip each morning for fresh bread, cook the simplest of meals with local ingredients and try out local street food or inexpensive restaurants where the locals go to eat. It’s fun to have tapas in Spain, or pizza from street vendors and the most amazing ice cream at the local gelateria when in Italy. You must try chips with mayo in the Netherlands – they are the best! Watch out for extra bits of plastic when you eat out or take your meals in a hotel. The list is long and includes items such as individual plastic milk pods and individually wrapped biscuits with your coffee, fizzy drinks in plastic bottles, plastic straws and cocktail stirrers, a plastic wrapped hot towel after an Indian curry, take-aways in Styrofoam boxes, plastic cutlery, juice in tetrapak cartons… There are so many plastic items that we don’t even think about until they are given to us and even then, we forget that we can simply refuse them and give them back. If you need something to nibble on with your evening drink, get a small starter instead of crisps and peanuts which are inevitably wrapped in plastic foil. If you are on a self-catering holiday and travelling by car or by airplane with a big suitcase, you could take any of these basic items with you: coffee, tea, sugar, salt, spices, pasta, rice, lentils, tinned food, olive oil, soap, laundry powder, tea lights, etc. This is particularly nice if you shop unpackaged or at zero waste shops at home and so it makes sense to take these items with you in small quantities. My basic travelling kit includes loose tea and a tea strainer as well as ground coffee, all of which I am able to buy by weight and unpackaged at home. If you don’t already shop in this way you might find that, conversely, you would like to stock up on some plastic-free items abroad and bring them back to the UK with you: in Holland and France I found pasta, rice, salt, soya sauce and other non-plastic packaged items I had long been looking for and so I came home laden with a stack of these. In the UK you can check this list for zero waste and refill shops near you. On the way from the UK to the Switzerland recently, we shopped at an outdoor market in the South of Germany. Having brought our fabric bags and lunch boxes, we were able to buy enough fruit, veg, fresh herbs, olives, bread and cheese to last us for the entire first week of our holiday. The market was the best I’ve seen. 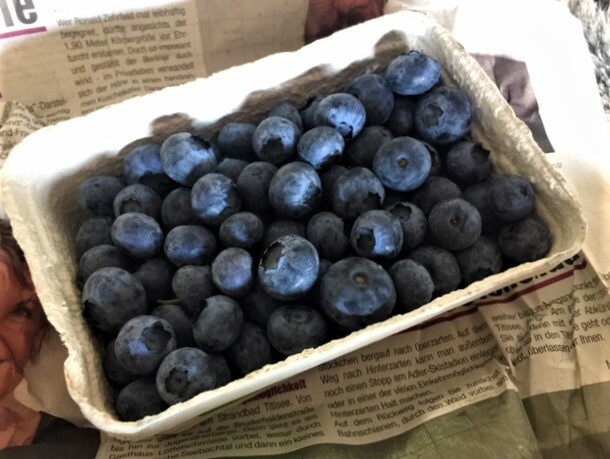 Every single item was sold unpackaged or in carboard punnets, including lettuces, cucumbers, spinach and blueberries – all items that are hard to find without plastic packaging in the UK. Most of them were ‘bio’ which is the German word for organic. Once we arrived at our destination, I knew that some food in plastic packaging was unavoidable, for example milk. Ironically, all around us we could see cows with great big swinging udders, sounding the beautiful bells that are hung on soft belts round their necks. But with some planning and armed with our basic travelling kit we managed to keep our plastic rubbish down to a bare minimum. Lastly, a top tip on dealing with your rubbish whilst on holiday: collect food scraps and anything moist like coffee grounds and egg shells etc. in one of your lunch boxes or wrap it in newspaper and take this out to the bins at the end of each day. Recycle glass and cardboard in the usual way and put all other rubbish (dry only) in a paper shopping bag. That way, you will avoid plastic rubbish bags altogether! This entry was posted in On Holiday, On the go and tagged plastic-free, plastic-free holidays, plastic-free-travelling, zero plastic abroad, zero waste on June 7, 2018 by admin.